WESTLAKE, KATE EVA (Yeigh), journalist and author; b. 1856 in Ingersoll, Upper Canada, daughter of William Westlake and Ruth Carne; m. 1 Oct. 1892 Frank Yeigh* in Toronto; they had no children; d. there 4 March 1906 and was buried in London, Ont. Kate Eva Westlake spent her early years in Ingersoll and then in London, where her father was a successful merchant. In the 1880s, along with Sara Jeannette Duncan*, Elmira S. Elliott, Kate Massiah, and others, she spearheaded the entrance of women into the ranks of professional journalism in Canada. Her career, like those of women pioneers in many fields of endeavour, was sparked by the death of a male relative. In 1881 her elder brother, William Edward, in partnership with James Samuel Brierley and Edmund Ernest Sheppard*, established the first daily paper in St Thomas, the Evening Journal. Upon her brother’s sudden death on 6 Oct. 1881 at the age of 27, shortly after the appearance of the new paper, Kate took over his business and editorial position; she would retain some connection with the Journal until at least February 1893. However, so few issues and records have survived that her contribution can be assessed only in general terms. It was likely here that she published the humorous sketches she is known to have written under her pseudonym Aunt Polly Wogg and also some of her untraceable serial stories, such as “Stranger than fiction,” “A rolling stone,” “Eclipsed,” and “A previous engagement.” A number of the latter may have appeared as well in the weekly Canadian Fireside, which she edited for a time. This family story paper was published in Toronto by Sheppard, but all record of it seems to have vanished. An enterprising literary entrepreneur, Kate took quick advantage of the death of Chief Sitting Bull [Ta-tanka I-yotank*] to compose an anonymous dime novel for the American market, according to Hector Willoughby Charlesworth*, a Toronto journalist. Sitting Bull’s white ward, written in a sensational style, hit the New York stands in early February 1891, less than two months after the demise of its subject, and earned its author $500. 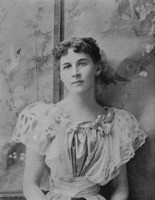 After her marriage the following year to Frank Yeigh, Ontario public servant and man of letters, Kate continued to write, with signed stories and articles in Saturday Night (founded by Sheppard in 1887) and the Canadian Magazine and unsigned contributions to other publications, such as the travel letters mentioned in her obituaries. In addition to the works mentioned in the text, Kate Westlake Yeigh is the author of “Hunting for Jacques Cartier,” “The heroine of romance: an autobiography,” and “Coals of fire; a story of Cacouna,” in the Canadian Magazine, 7 (May-October 1896): 105–10, 12 (November 1898-April 1899): 67–69, and 27 (May-October 1906): 463–68; and “Marie Hazelwood’s miserable Christmas” and “The evidence of things not seen” in Saturday Night, Christmas number 1889: 36–37, and Christmas number 1899: 25–30. Sitting Bull’s white ward; or, the ghost dancers of the Sioux was published anonymously in the Old Cap. Collier Library (New York), 2 Feb. 1891. A biographical sketch accompanied by a portrait appears in American women . . . , ed. F. E. Willard and M. A. [Rice] Livermore (rev. ed., 2v., New York, 1897; repr. Detroit, 1973). AO, RG 22, ser.305, no.18735. Evening Journal (St Thomas, Ont. ), 5 March 1906. Globe, 5 March 1906: 14. Toronto Daily Star, 5 March 1906: 4. Charlesworth, Candid chronicles. Lucille Stephens, “The St. Thomas Times-Journal,” Western Ontario Hist. Notes (London), 7 (1949), nos.1–2: 2–5. Vignettes of early St. Thomas; an anthology of the life and times of its first century, comp. W. C. Miller (St Thomas, [1967? ]), 134–35. Carole Gerson, “WESTLAKE, KATE EVA,” in Dictionary of Canadian Biography, vol. 13, University of Toronto/Université Laval, 2003–, accessed April 18, 2019, http://www.biographi.ca/en/bio/westlake_kate_eva_13E.html.